If you expect a lot of visitors over the holidays, then you’ll want to make sure your doorways are well lit. Not only should you make sure you’re swapping out the old incandescent bulbs for warm LED bulbs but also make sure your Christmas lights are secured. You don’t want them blowing off in the wind. This is the time of year that you want to make sure everything in your kitchen is in working order. There is going to be a lot of baking and cooking coming up the following weeks and you don’t want anything breaking down. Of course, an appliance that isn’t working or one that’s missing is a perfect excuse to make a special request of Santa. You might also want to think about buying a separate freezer. This is a smart investment given how much you can stock in there and not just during the holidays. A backup freezer can be placed in the garage without taking up a lot of room. You’ll find yourself buying a lot more in bulk this way and that’s a good thing. If you have a fireplace, then you should make sure you have your annual fireplace clean up. Getting your hearth and chimney inspected by a pro is a good way to prevent accidents. But it is not just a fireplace that you need to be aware of. Make sure if you light a candle that you put it out before leaving the room. You don’t want those burning overnight. Hopefully, you swapped out your smoke alarm batteries at the last daylight saving time. If not, then add that to your list. 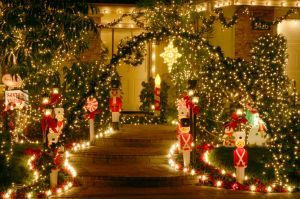 Before you put up one sprig of Holly or string one strand of lights you want to make sure that all the rubbish is removed from your home. Even though you might not be decorating your garage with the inside of your closets, it’s going to help to clear out that clutter and make more room for other things. To get that job done you only have to hire Junk King Monterey. These are the junk removal pros who can remove all kinds of furniture, appliances, electronics and other household goods. Make sure your home is merry and bright for the holidays by getting rid of the junk first. Junk King Monterey can take care that! This entry was posted in Monterey Junk Removal and tagged holidays, Junk King, Junk Removal on November 27, 2017 by Junk King. Last updated November 27, 2017 .